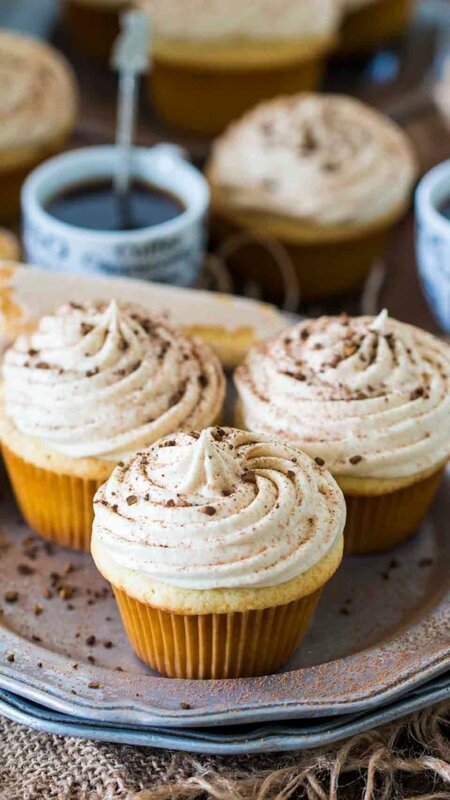 Tiramisu Cupcakes are a delicious take on the classic Italian dessert. Infused with a kahlua and espresso mixture and topped with mascarpone cream. 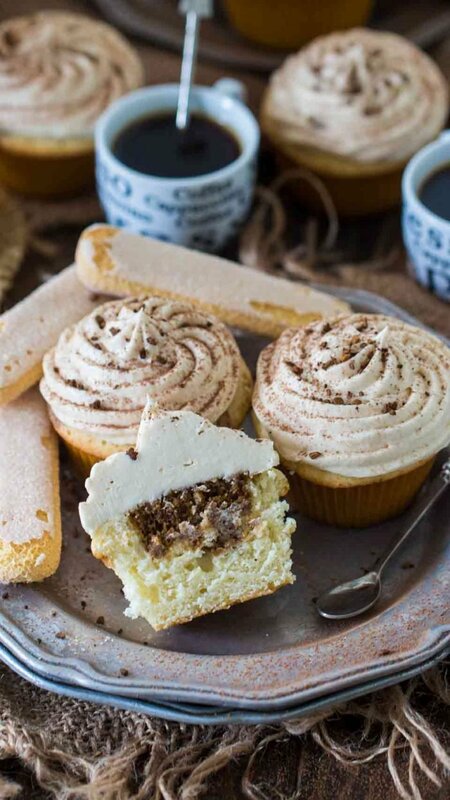 Tiramisu Cupcakes are like delicious mini individual Tiramisu cakes! This fun take on classic Italian desserts is guaranteed to become a dessert table star. 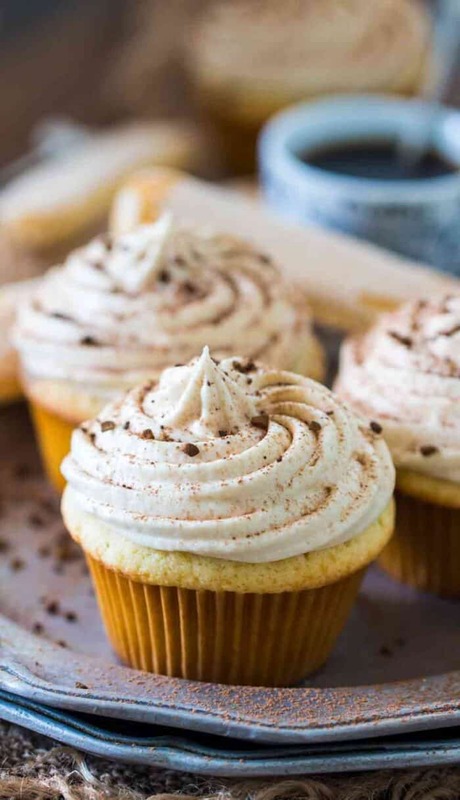 The Tiramisu Cupcakes are light and fluffy, infused with a tasty espresso and Kahlua mixture and topped with a creamy mascarpone buttercream. A sprinkle of cocoa powder and instant espresso granules are added to tie the dessert together. While these may look complicated, I assure you they are one of the easiest and most delicious desserts you can make. Fear aside, get the flour and sugar and start on these asap, you can thank me later. Make sure all the ingredients are of room temperature, even the eggs and the milk. For an even lighter and more cloudy texture, you can sift the flour, baking powder and salt. If you have a milk allergy or intolerance, you can substitute with soy or any nut milk. I have successfully tried this recipe with a mix of coconut and almond milk. 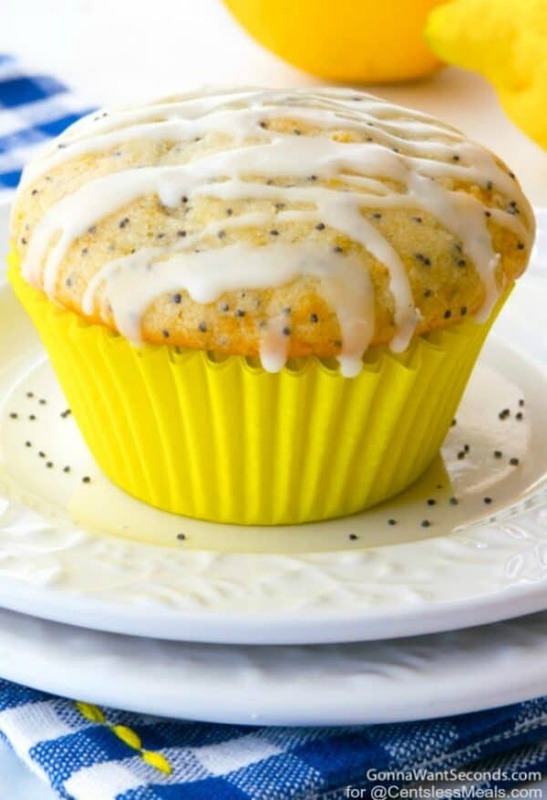 You can also top the cupcakes with dairy-free whipped cream or a buttercream made from dairy-free butter. 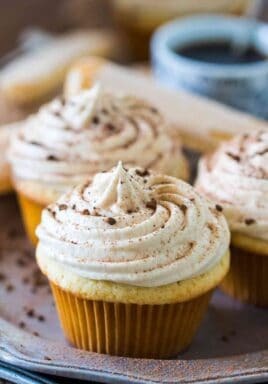 I like to top the Tiramisu Cupcakes with a creamy buttercream made with butter and mascarpone. Another delicious alternative, also more budget friendly and easier, is to top the cupcakes with whipped cream. 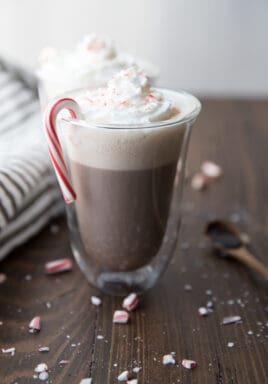 If you are making your own whipped cream, use 3 cups of heavy cream, 1/2 cup sugar, 1 tablespoon espresso, 1 teaspoon vanilla extract and optionally 1 tablespoon of Kahlua. Whisk all the ingredients together until thick and creamy. Careful not to over beat, the frosting will get grainy. Watch the cupcakes closely when baking, each oven is different, so start checking at the 20 minutes mark. It took mine exactly 25 minutes to bake. The cupcakes will continue to bake in the pan, so after removing them from the oven, let them cool in the pan for 5 minutes, after that transfer the cupcakes to a wire rack. The cupcakes should be fully cooled before topping with frosting. 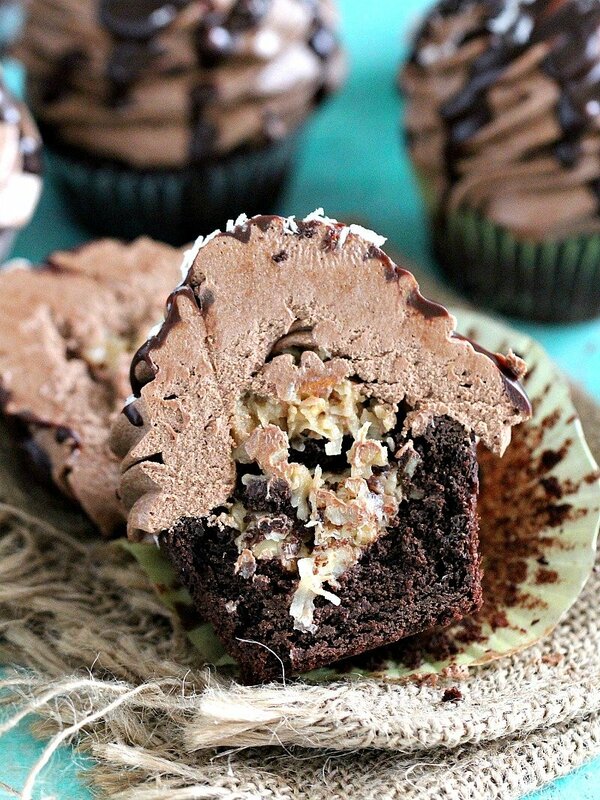 You can make these cupcakes 1-2 days in advance and store in the refrigerator. Preferably, they are best served within 24 hours. Tiramisu is a classic Italian dessert, made with ladyfingers dipped in coffee, layered with a creamy whipped mixture made of eggs, sugar, and mascarpone cheese. The egg yolks in the cream are usually raw per the traditional recipe, but they can be skipped. In these Tiramisu Cupcakes I have not used raw eggs in the cream. Is Tiramisu made with alcohol? The traditional Italian recipe does NOT ask for any alcohol, but if you want to add some Kahlua, Amaretto or even Baileys are delicious alternatives. Do I need lady fingers to make Tiramisu Cupcakes? No, you don’t. You can use some to garnish the cupcakes with, but you don’t need lady fingers to make the cupcakes. 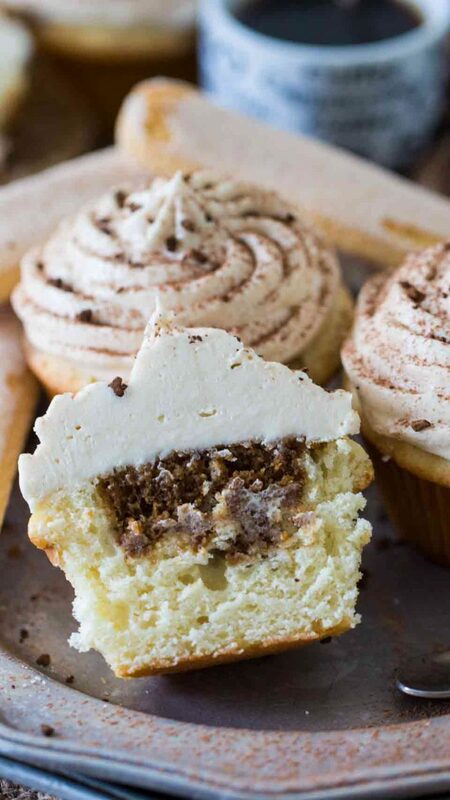 Tiramisu Cupcakes are a unique and delicious twist on the classic Italian dessert. 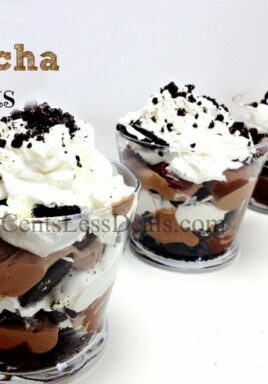 Easy to make and so fun to eat I know they will quickly become a favorite dessert in your home! Line 2 cupcake pans (I used 2 regular muffin pans) with cupcake paper and set aside. Beat in the eggs, preferably one at a time, making sure each one is fully incorporated. Add the vanilla and beat to combine. In a separate bowl, whisk together the dry ingredients: flour, baking powder, and salt. Add the flour mixture to the butter mixture, alternating with the milk and beat on medium speed. Scrape down the sides and bottom of the bowl and mix again. Spoon the batter into the prepared cupcake pans. Bake for about 20 to 25 minutes, or until the cupcakes spring back when lightly touched. Remove the cupcakes from oven and cool in the pan for 5 minutes. After 5 minutes, take out the cupcakes from the pan and place them on a cooling rack to finish cooling completely. In a larger cup, mix the espresso powder, Kahlua (if using), and sugar into the hot water. Set aside. 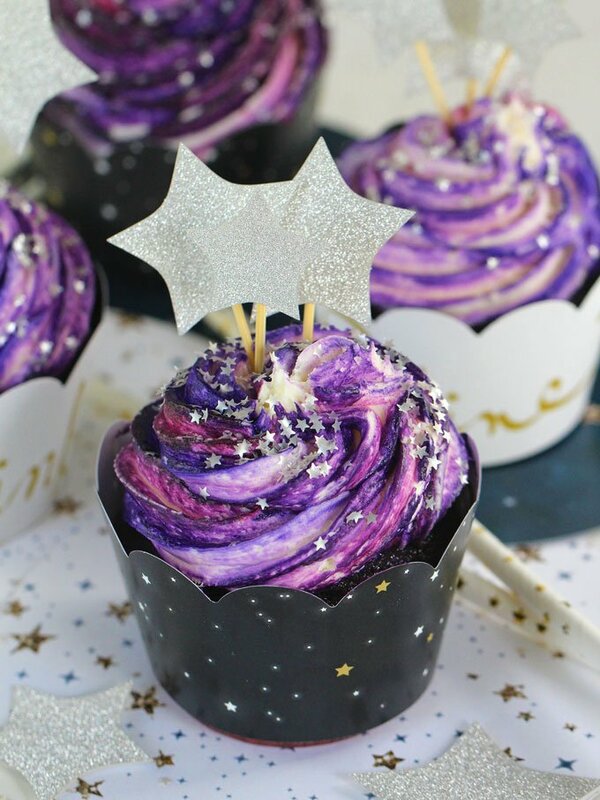 Once the cupcakes have cooled completely, using a fork, poke the tops of each cupcake a couple of times and add about 2 teaspoons of Espresso Mixture over each cupcake and allow it to soak in. Add butter to a large bowl and beat for about 1 minute until smooth. Add 2 cups of powdered sugar and 2 tablespoons of espresso and beat until smooth. Add 2 more cups of powdered sugar and the Kahlua (if using) and beat until smooth. Gently fold in the mascarpone cream. If the mixture is too thin, add one more cup of powdered sugar and beat with the mixer on low speed, mix just until smooth. Don’t over mix the msacarpone cheese or it could become too thin. Sprinkle the tops with some cocoa powder and coffee granules if desired. Chill until ready to serve. 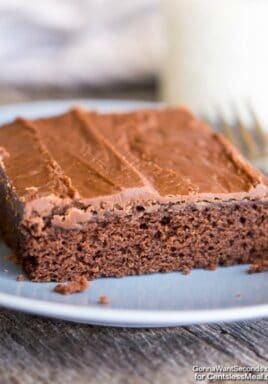 Preferably let them sit at room temperature for 20-30 minutes before serving, to allow the frosting to become softer, otherwise it may be too firm.